A complex cologne with a new twist to it. Pulsing those intricate and highly sort after notes throughout wear, Silver Cologne isn’t the archetypical cologne. I might even go as far to say that Silver Cologne really shouldn’t be called cologne, but really a rather dilute fragrance in typical cologne style. A spicy start to Silver Cologne may be off putting at first, but let those notes perish and something much better is delivered. Those who often have a distasteful sentiment for citruses always resort to calling said fragrances ‘domestic’ or ‘like cleaning product’ and I often avoid being too harsh in description – yet Silver Cologne certainly smells like a lemon cleaning product in the first few moments. Notes of very sour plum and our cologne ingredients of bergamot, mandarin and orange blossom are what you’ll first receive and are bright and forceful just like every other cologne opening. Immediately transient, the chemical astringent accord is replaced by florals and incense. At this stage Silver Cologne starts to replicate Gold Man with considerably less or no civet and is turned down by a considerable number. Instead of the intensity of civet and the animalic powdery feel, what is received are the powdery musks of white florals. However, even these florals are somewhat ‘overly-ripe’ or indolic (a slightly ‘off’ characteristic) in the same manner that Gold Man has an acrid vibe to it. But Silver Cologne is cohesive with its indolic characteristics, and masterfully homogenises them to never become fetid, but rather a harmonious fragrance in typical Amouage style – weird at first, and then less weird yet heartily enjoyable. Silver Cologne is unique in the way it blends cologne with typical Amouage ‘Oman’ exotica, but never harmonises in the same way that say, the renowned and revered Jubilation XXV does; that’s distinctive, this isn’t to some extent. On skin, the classic eau de cologne can be smelt, but a smoky nebula always exists above it. Amber, incense and the hallmark note of silver frankincense make their expected appearance giving exotic body and base. What we get overall is a musky and heavy cologne lavish with florals. Jasmine, rose, heliotrope and ylang-ylang are the heart notes imparting richness with a mild lingering of perpetual citrus lemon cleaner (and thankfully this almost disappears). The florals are never individually able to be identified, which is a favourite of mine when smelling florals. The richness of patchouli and sandalwood can be detected; and in my opinion when combined with the florals overall, is somewhat redolent of a classic fruity chypre, after all, the notes are there (airy with a heavy base). Smell this side by side with Guerlain’s Mitsouko and some similarities may be detected. Alternatives: Pour Monsieur by Chanel; Mitsouko by Guerlain; Gold Man by Amouage; and Gold Woman by Amouage. An unconventional fragrance, my favourite kind. Deceptive lemon cleaner champagne opening, but still champagne nevertheless. This fragrance rewards patience. 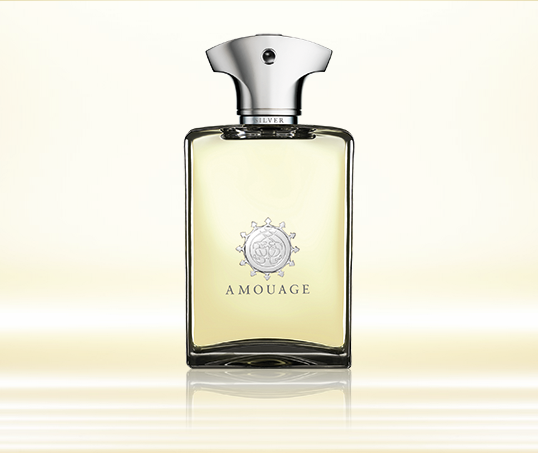 This entry was posted in Amouage and tagged Amouage, Cologne, Fragrance, fragrance review, Silver, Silver Cologne. Bookmark the permalink.